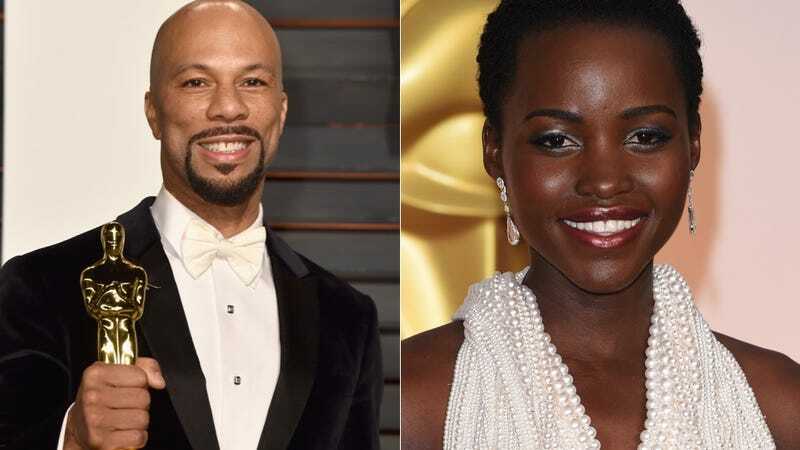 Common and Lupita Nyong'o were recently spotted on an Is-It-A-Date in New York City. It's inevitable where this will lead. I hear the faint chime of wedding bells. And a spoken word vow. Lonnie Lynn, 42, is an Oscar-winning rapper from Chicago—and a catch—whose previous long-term relationships (tellingly) include Erykah Badu and Serena Williams. He is outwardly attracted to success and power. Lupita Nyong'o, 32, is an Oscar-winning actress rumored to have dated rapper K'Naan. You know him. She's also been linked to (bear with us) Jared Leto. You may not know him. That's a thing that need not happen. She should be riding into the sunset with Common, a jovial MC with sharp, handsome facial features and a stroke-worthy beard. According to several lurking eyewitnesses, the would-be couple had somewhat of a date night at the Pershing Square Signature Center on Tuesday. It's real because people tweeted about it ("So I'm at the @pershingsquare1 and ran into Common and Lupita on a date"). They were, serendipitously, taking in the off-Broadway play Big Love. Big love. Big, if true. It's unclear whether this was a play date or like a date-date or like "let's hang out together" or like "you want to do something" or just a work thing or just like friends hanging out whatever haha. But let's be real. It doesn't matter. Nothing is ever a date. Everything is always a date. Two single people go out and do something nice together, it's a date. Besides, these two Pisces have something in ... common. That naked gold Oscar. Before long, Lupita will be walking down the aisle in a custom ivory-colored gown shipped overnight from the heavens of the fashion gods. Common will look deep into her eyes at the altar and recite the most beautiful 17-minute spoken word poem anyone's ever heard. Lonnie and Lupita Nyong'o Lynn. It sounds good. These two talented, attractive Oscar winners should get married.